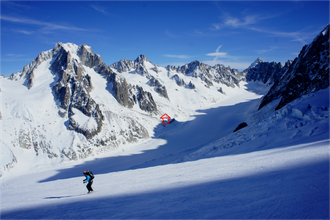 Shredding down the glacier to the Argentière hut. 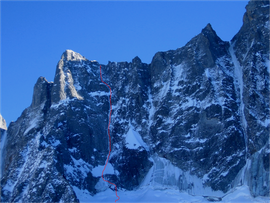 After a couple of days in Chamonix we had bailed some winter-routes because of crowdedness, daylight conflicts and insufficient route finding skills. 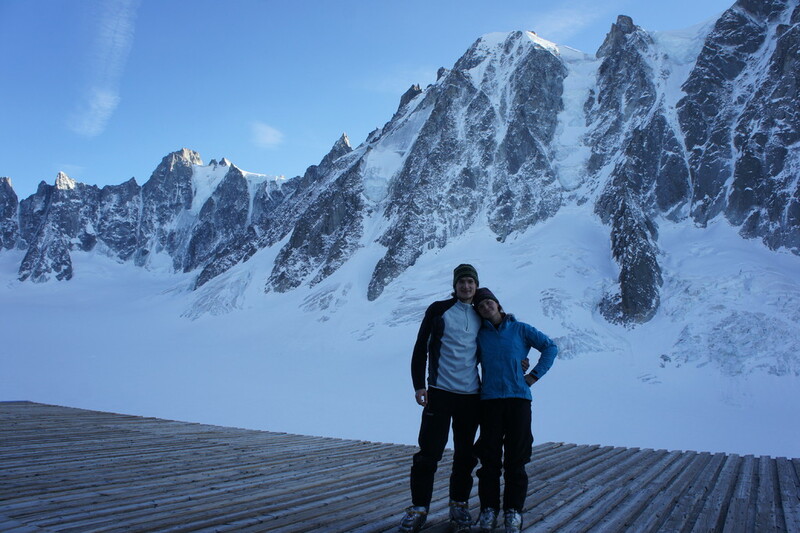 So we decided to set up our base camp at the Argentière hut winter room. 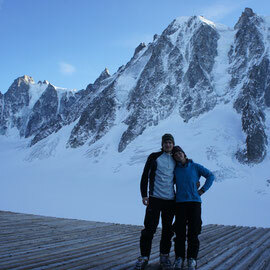 We skied in from the Aiguille des Grandes Montets (cable car) along the Argentière glacier. 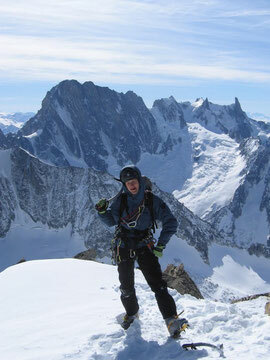 Chrissi posing on the summit of Les Courtes. 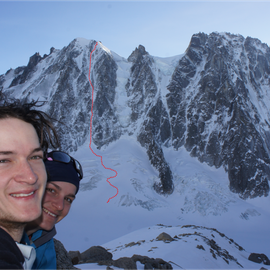 Next morning we started at 3:30 to climb the Suisse Route at Les Courtes. In the dark we found ourselves at the bottom of Les Droites…hm. 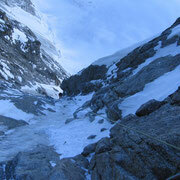 Not quite an onsight but after a bit of traversing we climbed up the very steep bergschrund of the Suisse route. 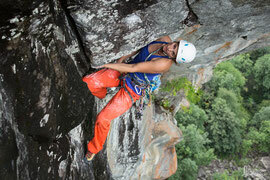 We simul-climbed most of the 800m route, 4 belays along the way plus one on the summit. 12:30 we were sitting in the summit sun and posing for photos in front of the stunning view over Grand Jorasse (very dry this year) and the entire Mt Blanc region. Wow! 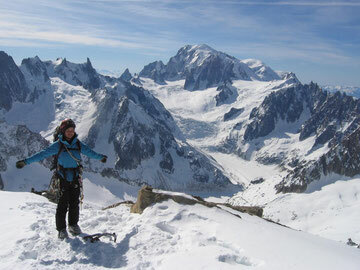 Woohoo, summit of Les Courtes and Mt Blanc view! 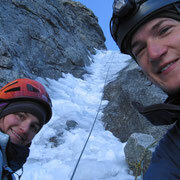 Mhhh, we love winter alpinism! We followed the ridge east to the top of the NE route. 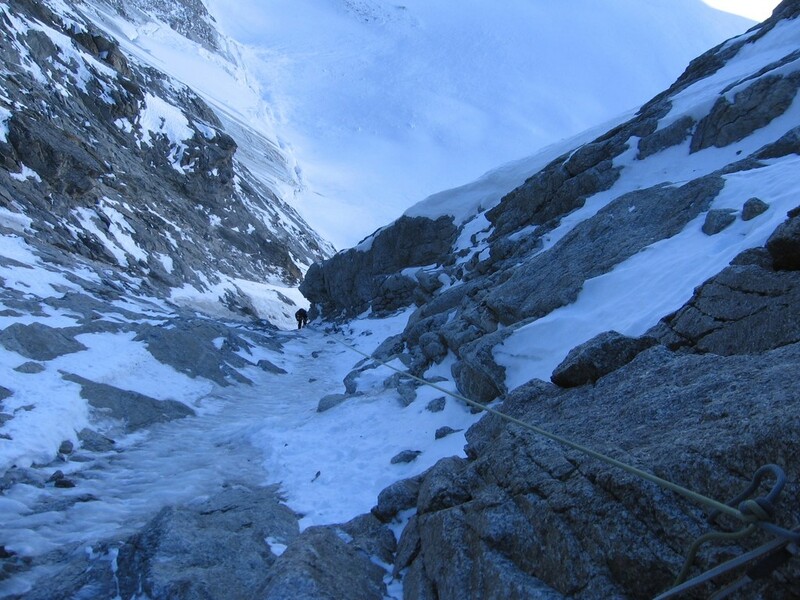 6 abseils and endless downclimbing led us back to the glacier and to our skies (which we carried to the hut because it was dark already). 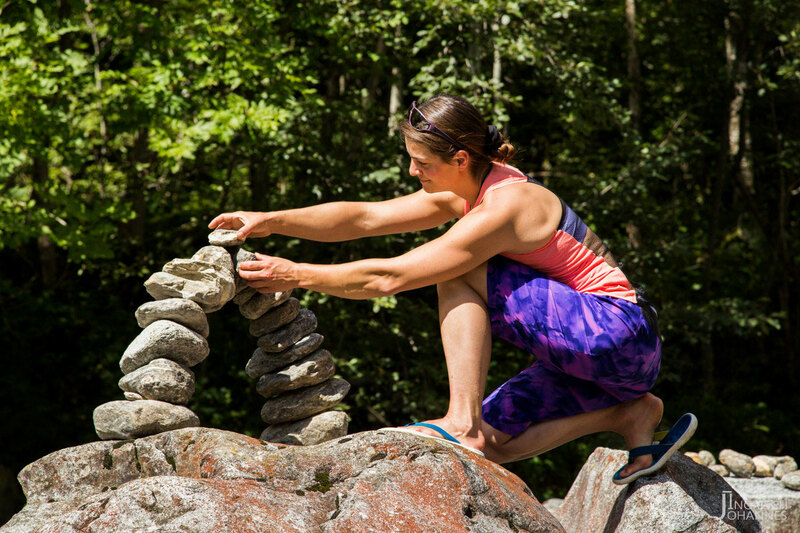 The winter room was crowded and warm, food was exquisite and after 12h of beauty sleep, we decided to take a rest day, chopped wood for the fire place in the hut, scrambled up towards Col du Tour Noire and scoped out routes for the next day. 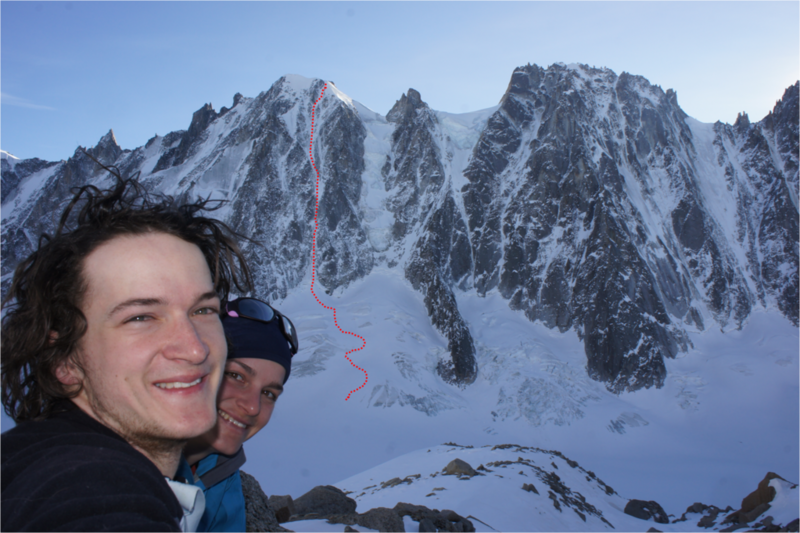 We were psyched for Charlet Ghilini up Mt Dolent, but it looked super dry and so another tiny white and icy line in the very back of the Argentière bassin attracted our attention: Petit Viking to Pointe Domino (right next to Chrissis knee the picture above). 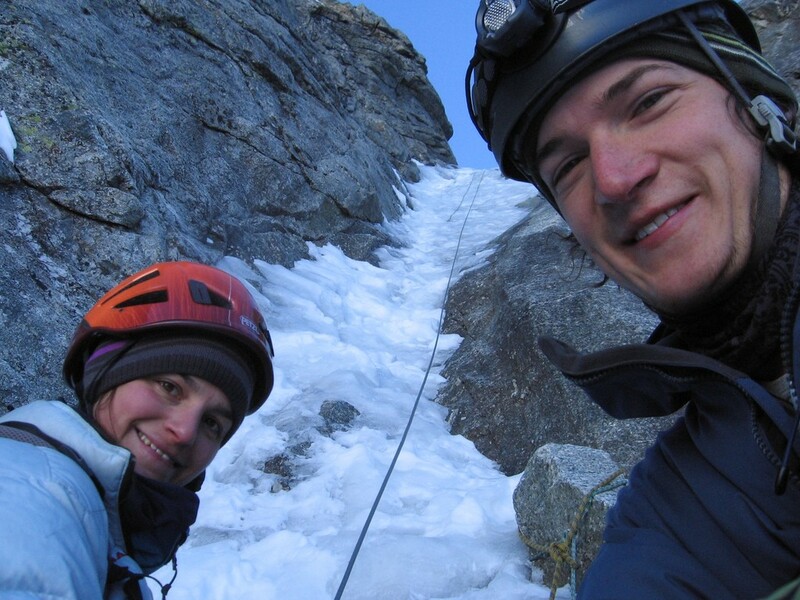 Next morning, after 2,5h of skinning up to the base, Chrissi started a very delicate and tricky drytooling pitch that would lead us to the snowfield below the couloir line. Hard work at 6 in the morning but he cruised it and we run up the beautiful 500m route!